George Rickey’s kinetic sculptures become forms through movement in time and space, functioning within the limits of gravity and air to produce naturalistic movement from abstract, industrial geometry. 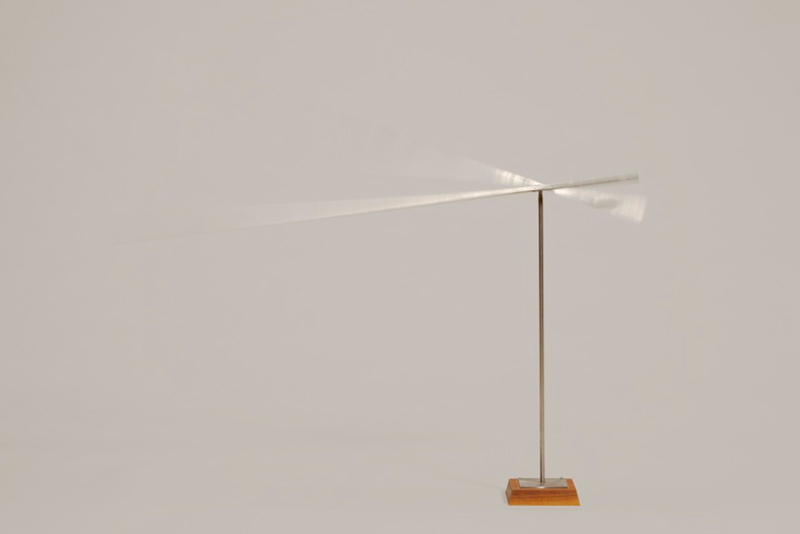 In Two Horizontal Lines, twin blades of stainless steel pivot on a simple fulcrum, differentially weighted to allow them to move independently, while balancing each other in essential relationship. Rickey’s careful engineering of the elements defines a controlled and predictable path of potential motion, but the actual movement within that sweeping vertical trajectory is entirely due to chance, with the blades responding to changes in the air currents of the environment around them. As we view this small-scale object, our physical presence and progression around it actively contribute to its movement, and therefore the form it takes. This interactive quality energizes the entire space between and around viewer and sculpture, instilling a sense of natural rhythmic balance, and inviting us to consider the tension between order and randomness, present everywhere in our world.